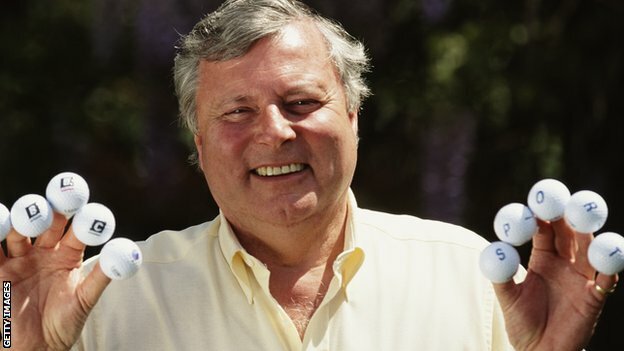 Peter Alliss, the 81 year old BBC commentator, he of the syrupy, silky voice, is to be inducted into the World Golf Hall of Fame. Peter will join Phil Mickelson, Sandy Lyle, Dan Jenkins and Hollis Stacey at St. Augustine, Florida for the ceremony on Monday. Apart from his great knowledge of golf, and all things golf, Peter would also dispense some good old-fashioned wisdom of life. I remember one of those sayings, he related this in the middle of a Major, " Don't forget what your mother told you, always dry between your toes after a shower." This is medical advice, this course of action prevents the affliction known as athlete's foot. Why Peter would slip this little piece of wisdom into his golf commentary is debatable, but all the same, useful. Peter's golf commentary was never boring, and unlike many of his TV pundit pals he does not resort to mundane and often repeated phrases. Things like, "this is one of the best courses on tour' or he is one of the finest ball strikers on tour. The one that annoy's me most is the line, 'to play this course well you need to hit all the fairways, and the greens in regulation. Everybody everywhere who plays golf knows that you need to do that, even on your Municipal course. Peter brings a nice balance to his commentary. He also can enjoy a joke, the registration plate on his car "3 Putt" can attest to that. Long may he continue. Peter said of his award; "It's all come as a bit of a surprise for me." I know people think I am a bit loud-mouthed and arrogant but I don't take praise very well, I feel embarrassed by it all." The World Golf Hall of Fame is home to some the game's best players and contributors. People recognized within the Hall of Fame represent individuals who have positively impacted the game of golf on the grandest scale. Both professional and amateur golfers, architects, journalists, innovators and teachers are among those who have been celebrated. Peter has completed 50 years of broadcasting the Open Championship for the BBC, and also done other things, apart from his golfing career. As a professional player he won 23 tournaments worldwide, including three British PGA Championships, two Spanish Opens, one Italian Open, one Portuguese Open and one Brazilian Open. He also made eight appearances in the Ryder Cup, the first of which came in 1953 and saw the Alliss family become the first ever to have father and son play in the event. "I have had five or six career's really. I was a club professional, a tournament professional, an international player, a golf course designer and constructor, a writer of books and, of course, I have worked in television with the BBC, ABC in America and Australia, CBC in Canada and all round the world. I have done a range of TV shows; A Round with Alliss, Pro-Celebrity Golf and Golfer's Travels and it's been amazing really. I haven't set out to do any of those things, it just happened. Every episode of my life has been very rewarding." Peter Alliss will now stand alongside the likes of American legends Jack Nicklaus and Arnold Palmer and fellow Britons Nick Faldo and Tony Jacklin in the Hall of Fame.